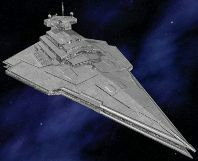 Not in service until after the end of the Clone Wars, the Victory II-class Star Destroyers were produced in lesser quantity than the Mk.I model, yet came to have significant influence on Imperial ship-manufacturing. Designed for deep space-combat, these vessels traded firepower, shields, hull strength and carrying capability for speed and maneuverability. With this in mind, the designers fitted the ships with powerful Hoersch-Kessel engines, as well as adding ion cannons and enhanced tractor beam projectors for interdiction duty. The most notable difference between the classes was that the banks of concussion missile tubes found on the Victory I were removed in favor of the unlimited number of shots provided by turbolasers. The Victory II-class Star Destroyers were used as patrol and blockade starships, as well as having main duty serving as sector patrols. They were sent out in pairs or with other ships, regularly moving into areas of suspected Rebel or pirate activity to pacify the sector. Although it had the same distinctive atmospheric maneuvering surfaces as the Victory I, this class was incapable of entering atmospheres. Updated with increased sublight speed, lower thrust cost, and reduced primary armor.